March 8, 2019 | This article catalogs the current status of U.S. tax treaties and international tax agreements as of February 22, 2019. The following articles by KPMG Tax professionals were published by Tax Analysts in Tax News International. The articles provide flowcharts to assist practitioners in determining a company's eligibility for treaty benefits under the limitation on benefits provisions of the specific U.S. income tax treaties and, where applicable, in determining eligibility for a 0 percent withholding tax rate on cross-border intercompany dividend payments to the company. * Based on treaty protocol. 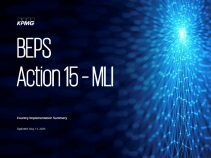 This document provides an overview of countries that intend to sign on, or have already signed on the OECD's BEPS Action 15 Multilateral Instrument, as of April 9, 2019.